In Jonathan Biggins' new play Talk, the media is in the spotlight. What does the current, digital-first, 24-hour rolling coverage mean for journalism? Does the average person know more or less about the news now than half a century ago? And how did it all come to this? Below, we zip through decades of complex history and economics, with notes on some of the key turning points and landmarks on the road from analogue to digital journalism. The first rudimentary communication via ARPANET – the precursor to the Internet – takes place. Media mogul Ted Turner launches CNN. Radio-based equivalents existed earlier but, as the first 24-hour TV news service, it is seen as the primary catalyst for our contemporary 24-hour news cycle. Telecom Australia launches Viatel, a teletext service that allows TV viewers to dial up news or go shopping via a TV and modem. Various incarnations of this technology had existed in Europe since the late 1970s (it was known as Prestel in the UK). Viewing one page of information cost almost $3 in today’s money. The World Wide Web, invented by Sir Tim Berners-Lee in 1989, becomes the public face of the internet. Aftonbladet, a Swedish evening paper, becomes the first major daily paper with a web presence. Britain’s The Daily Telegraph follows a few months later. 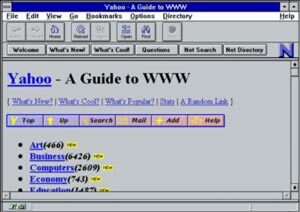 The same year, “Jerry and David’s Guide to the World Wide Web” launches – it is later renamed Yahoo!. ABC and The Age become two of the first Australian media organisations with an online presence. Google launches. The number of internet users around the world has been doubling year-on-year, from 16 million in 1995 to 70 million in 1997. Web portals from the likes of Yahoo! and MSN aggregate user-customised news from wire services like Reuters and AP as well as media mastheads, thereby competing with media company websites as the first port of call for news headlines. The website Blogger launches and popularises the idea of a weblog. The Independent Media Center website launches in the wake of the anti-globalisation protests in Seattle – offering news from a global network of independent journalists. Early the next year, OhmyNews brings similar citizen journalism to South Korea on a large scale. eBay launches in Australia. The dot-com boom is over. Online divisions of news organisations are generally in the red with no profit in sight. The September 11 attacks in the US serve as devastating proof of the world’s appetite for 24-hour rolling coverage. News media websites are swamped by traffic – some remove advertising in order to reduce server loads, others simply remove all other news coverage. The term Web 2.0 enters popular discourse. Loosely defined, it marks a new age of user-generated content and social networks. MySpace had launched the year prior. In 2004, it was Facebook’s turn. YouTube launches. Rupert Murdoch delivers a speech to the American Society of Newspaper Editors describing younger generations as “digital natives”. Agence France-Presse sues Google for including AFP’s photos, stories and news headlines on its news aggregation service Google News without permission. WikiLeaks launches. Twitter launches. In the following years, Twitter grows its popularity amongst journalists by helping to break news on the Mumbai terror attacks, earthquakes in Sichuan and the Iranian presidential election protests. American firm Tribune Media – owner of newspapers including the Chicago Tribune and LA Times – declares bankruptcy. The Australian newspaper adds a paywall to its website. Following years of newspaper closures and job losses in the developed world, over 3,000 Australian print-media jobs are cut. The story is different in the developing world – India’s newspapers report booming print circulation numbers, as income and literacy levels increase and internet use remains low. The Guardian newspaper launches in Australia as a web-only offering. A new German law requires Google to pay a copyright fee to news media when including snippets of stories in search results; Google responds by not linking to German publishers who make claims for compensation, causing daily paper Bild to lose up to 80% of its web traffic until it cancels its claim. A similar law in Spain, with no opt-out, is estimated to cost news publishers €10 million in lost revenue within the first year. Sydney Morning Herald print circulation drops below digital subscriptions for the first time. BuzzFeed launches in Australia. The final print editions of the UK’s Independent and Independent on Sunday are published as the title moves to a digital-only format. Fake news articles about the US presidential election, spread via Facebook and monetised via Google’s ad network, become news in themselves. The New York Times, after being attacked by President Donald Trump, sees renewed growth in its subscriptions – gaining 276,000 new digital and 25,000 new print subscriptions in the last three months of the year.